San Diego, with its wonderful Californian climate, relaxed outdoor way of life and great scenery offers students a unique opportunity for learning. Picture-postcard houses, golden beaches, secluded coves and rugged landscape the Californian way of life has to be experienced to be believed. San Diego has a temperate which is characterized by hot, dry summers and cool, wet winters. San Diego is usually mild and mostly dry with plenty of sunshine throughout the year; 264 sunshine days annually. 110 V; 60Hz - 2 flat-pin plug or third round pin are used. If you are not at school and are in an emergency you can call 911 for ambulance, fire department or police department from any telephone or call the school’s emergency number 1-858-449-3758. Call the doctor to make an appointment. It is rare, in the United States, to be able to see a doctor without an appointment. If you feel that you must see a doctor immediately, you can go to an emergency room. However, depending on the seriousness of the illness or injury, you may have to wait in line for many hours at the emergency room. If you want to consult a doctor when you are in the U.S., first of all please call the toll-free phone number on your insurance card in order to obtain a recommendation for a doctor nearby. Please show the doctor your insurance confirmation card. If the doctor has any questions about your insurance protection, ask him or her to call the insurance company directly. Some doctors and hospitals insist on the patient paying the invoice at the time of service. If this is the case for you, please send the original invoice together with the completed claim form to the addresses on the claim form. If you need immediate emergency care, call 911 or go to the nearest emergency facility. Southern California is a car-oriented and car-dependent society. Therefore, you may want to consider renting a car during your visit. You can rent a car for a day, a weekend, or by the week or month. There are several requirements if you wish to rent a car. You must have a valid driver’s license (from your home country is OK; you do not have to have an international) and you must have a major credit card or leave a cash deposit. Call 1-619-234-6161 (Yellow Cab) or 1-619-223-5555 (Orange Cab) if you need a taxi. Most places in La Jolla and San Diego do not have “taxi stands” or areas where you can get a cab on the street. Legal age for purchasing or consuming alcohol in the US is 21 and many places will ask for identification. Smoking is prohibited in all public buildings (including restaurants, bars and casinos) and enclosed spaces throughout California. It is illegal to smoke within 20 feet of doorways or windows of government buildings. It is even illegal to smoke on certain beaches and parks (e.g. 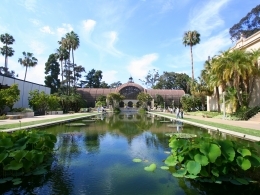 Balboa Park) in Southern California - so watch for signs! All EC students must be covered by health insurance for the entire length of their stay in the U.S.